Offering you a complete choice of products which include cam roller followers and cam follower. With the assistance of our competent workforce, we have been committed to offering quality assured Cam Roller Followers. These roller followers are widely used in machine tools and automotive parts. Our range of roller followers is precisely engineered under the strict supervision of experienced professionals at our end. Roller Followers are available in different sizes, dimensions, and thickness that clients can avail as per their needs. 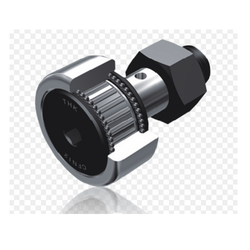 This type has a compact design with a stud diameter of 3 to 5 mm and an outer ring of the outer diameter of 10 to 13 mm, and this high-precision miniature cam follower is suitable for compact machine design. This type is used as guide rollers for electronic parts mechanisms, precision measuring equipment, office equipment, etc. for cam mechanism and linear movement with light loads and high accuracy, and they contribute to space reduction. This type can be installed in the same installation holes as the standard cam follower type, but the stud head is eccentric by 0.25 mm to 1.0 mm in regard to the stud head is eccentric by 0.25 mm to 1.0 mm in regard to the stud installation center, so that fine adjustment is possible simply by turning the stud, and this is a compact eccentric cam follower with high accuracy and a single-body construction, and it has the following special features. Precision machining is not required for the installation hole position, etc. so that the work steps for machining and installation can be reduced widely. This cam follower type has piping tap holes machined into the stud head part and the threaded portion of the standard cam follower. This cam follower type is most suitable for places requiring piping for centralized lubrication. We are known to offer the wide range of Cam Follower at industry leading prices that are used in various industrial applications. Cam followers are the standard as well as an eccentric stud, cage/needles guided, cylindrical/crowned outer race, grease filled ready to use. Looking for Cam Follower ?